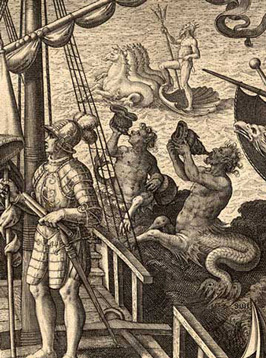 Detail from "Christophorus Columbus" by Stradanus (1592). About the art. The images shown on this web site are from original engraved copperplate prints designed by Joannes Stradanus (1523-1605) and printed in 1590-92. Stradanus was a Flemish artist (born in Bruges) who spent most of his life in Florence, Italy, where he was influenced by artists such as Raphael and Michelangelo. He produced a great diversity of paintings (esp. frescos), drawings, tapestries, and other artwork, and sent many drawings back to Antwerp where they were engraved and printed by the publishing firm of Philip Galle. The prints shown here come from two series printed by Philip Galle. One of the series, Nova Reperta (c. 1590), engraved mostly by Theodore Galle (Philip's son), comprises 20 prints showing various inventions and discoveries, including the book printing press and copperplate rolling press. The other series, Americae Retectio (1592), engraved by Adrian Collaert, comprises four allegorical prints and depicts the discovery of America, with Columbus, Vespuccius, and Magellan on their ships. It commemorated the centenary of the discovery of America. The original plates of both series were reworked and reprinted in 1638 by Joannes Galle.